Oxford County, Ontario, has just opened a wind farm as part of a project to go 100% renewables for electricity and heat. Craig Morris visited the project, which could become a role model for the entire country. “You are doing something special,” José Etcheverry tells a group of locals at an informal town hall meeting in Woodstock, the regional seat of Oxford County. “Yours is the first 100% renewable community project east of Vancouver,” he says with a smile. It’s a polite way of saying this is the only such project in the country. Professor Etcheverry’s class from York University visiting Oxford County. They are standing in front of a PV tracking unit, with two turbines from the wind farm in the background. The students came from more than a dozen different countries. At the same time, the county will not ban fossil fuels. Instead, consumption would be offset by renewable energy production to produce net-zero carbon emissions by 2050. A professor of environmental studies at York University, Etcheverry helped get the Oxford County project moving, as the website Smart Energy Oxford acknowledges. Now, he wants to make sure as many Canadians as possible hear about it. But it’s an uphill battle. “When the wind farm was inaugurated recently, no one from the media was here,” says Kris Stevens, an energy consultant and former head of the Ontario Sustainable Energy Association (OSEA). On the day I visited, Professor Etcheverry had asked me to tag along on a field trip with one of his classes. Our first stop was at a biogas plant. “We are sourcing biogas from local farms,” explained an engineer next to a biogas filling station. Next to him stood his company’s pickup truck containing a large gas tank in the bed. “The next part of the project is a 6 km pipeline to transport the gas to here from a facility where the gas is collected from farms,” he explained. During lunch, David Mayberry, Mayor of the Township of South-West Oxford, sits with me and two of Etcheverry’s students from Iran. “You should consider staying here,” he tells the young ladies, “we need more young, smart people like you.” It’s a common theme in small towns: how can we keep our own young people in town and attract young professionals from the big city? Later, Mayberry picks me up in county seat of Woodstock in his two-seater electric Smart. “The range is quite limited at around 80 km,” he tells me, “but actually, it takes me everywhere I need to go. Only rarely do I have to worry about charging for the return trip home.” Still, few other electric cars are on the road; giant pickups dominate the landscape – probably few of them running on biogas. And Woodstock is a typical American town; it is hard to get around without a car. 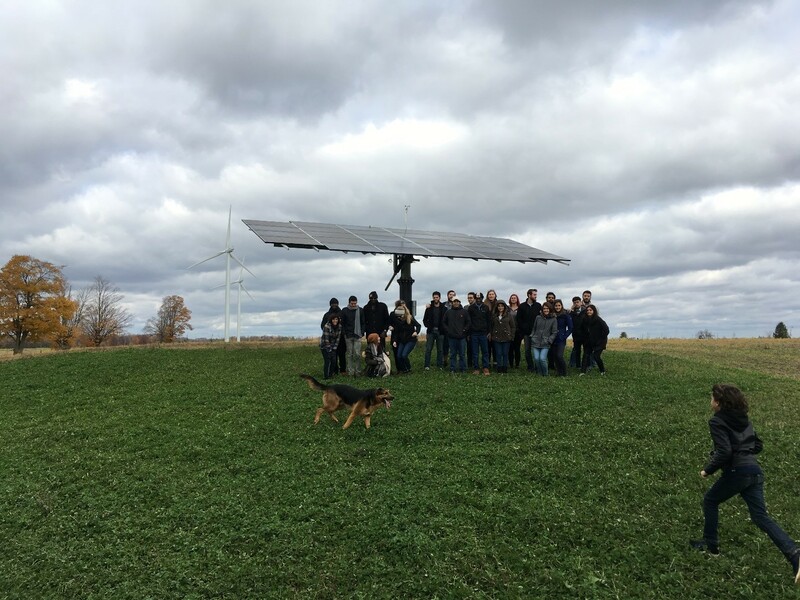 On our visit to the local community wind farm – the centerpiece of the project – we pass by a number of homes from which several turbines are clearly visible. I asked Miranda Fuller, Program Director of Future Oxford, how those residents feel about the visual impact. Opposition to wind farms is quite fierce in Ontario, largely because so few of the projects are driven by locals. In fact, when I was on the Ontario TV show The Agenda, the moderator Steve Paikin specifically asked me what to do about popular rejection of wind farms. Interestingly, she also explained that the farmers themselves were interested in hosting the turbines in order to protect their farmland: “Because of the wind farm, this land will definitely remain farmland for the next two decades.” The farmers thus used the project to protect themselves from developers – and “Woodstock is now closed off on this side from further sprawl because of the wind farm.” Meanwhile, farming continues unabated between the turbines. Etcheverry now wants to create a network of cycling paths through the wind farm. “It would be a great idea to get people to spend their free time out here right below the turbines so they can experience them firsthand,” he recommends. Most of all, Canadians themselves need to be told about this bottom-up success story. To that end, it would be good if the project would publish its own statistics annually showing what the costs and benefits have been. Rural communities in North America are falling behind. Oxford County just might set an example for others to follow. Interesting, wind turbines as farmer’s defense against encroaching suburbs, a sort of reverse application of the Bavarian 10H rule! That is how Energiewende started in Germany: farmers setting up wind turbines. I sometimes suspect the wind turbines protect more birds than they kill by preserving the land against encroaching suburbs, thus protecting nesting sites and feeding grounds. @ Clee: There is a paper ( Sovacool 2009) that shows that the pollution of coal power plants causes much more bird deaths per GWh than wind power. So replacing coal power by wind power indeed saves birds! Next PostIs the Mexican Geothermal Potential Freezing?